Galembo has worked for over twenty years photographing the rituals and religious culture in Nigeria, Brazil, Cuba, Jamaica and Haiti, as well as the homegrown custom of Halloween in the United States. She is currently a professor in the Fine Arts department of the University of Albany, NY and has published several books of her photography. 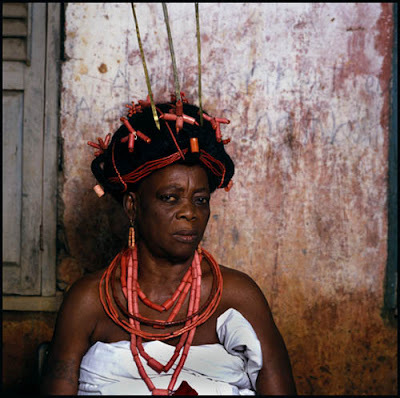 Acting as a photo-anthropologist, Galembo’s work is vital to the preservation of the rituals and ceremonies of these misunderstood and misrepresented cultures. View galleries of Galembo’s work online. PHOTO: Okao Aiwerioghene, Benin City, 1991 © Copyright Phyllis Galembo. All Rights Reserved.